…baked in our bakery up the road. 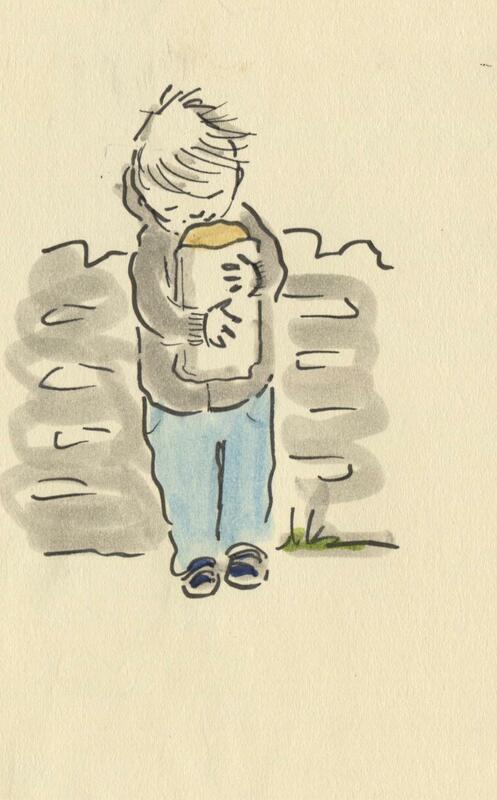 There is nothing else like it on a cold morning to carry home a warm loaf of sweet smelling bread. Posted on March 24, 2014, in Uncategorized and tagged Bread, Children, Doodlemum, Drawing, Family, Humour, Illustration, Life, Pen and Ink, Sketchbook. Bookmark the permalink. 10 Comments. I’ll bet he likes to nibble the corners! Did he, or didn’t he eat a sample? I used to do that when I was little and bread was rationed. Punishment was severe! That took me right back to when my youngest daughter used to hold the fresh bread sitting in her pushchair, by the time we got home the bread was half hollow! Just crust one end. She still loves fresh white bread, so do I with lots of butter! Thanks for bringing that lovely memory back. Gruff does that too, part of the perk of being chief bread carrier! There used to be two Tiaz but one has closed down as they retired. The bread is fab, I never waste a crust of it. Bread you can cut yourself is just the best.